Electrical Box Retort Furnace for De-Bindering Ceramic Composites - L&L Special Furnace Co, Inc.
L&L Special Furnace Co., Inc. has received an order for a large retort box furnace used for de-bindering ceramic composite pre-peg materials along with powder metals processing and hot isostatic processing. The main function o­­­f the furnace is to remove all organics and other materials used in the product prior to placing in a high-fire vacuum chamber. This de-bindering process is extremely important and allows for a finished product that is a very strong, lightweight part. The XLC3648 has a work zone of 29” wide by 29” high by 35” deep. It has a temperature uniformity of ±20°F at 1,100°F using six zones of temperature control with biasing to balance any temperature gradients. The furnace is constructed of low-mass insulation that allows for quicker cooldown times. It has a venturI cooling blower that will also aid in cooling, and is controlled by a Eurotherm program control with overtemperature protection. There is also a programmable flow panel to manage the nitrogen flow throughout the process. The parts are a ceramic matrix composite (CMC), which is a series of ceramic threads that are bound together and woven by a 3D printing system. These parts can be made into very intricate aircraft sub-assemblies for the smaller units as well as large engine parts. For more information, see our What Are CMCs article. The parts are heated to 1,220°F in a retort chamber that is pressurized with nitrogen. The byproducts of the outgassing part are directed by pressure and flow out of the rear of the furnace. 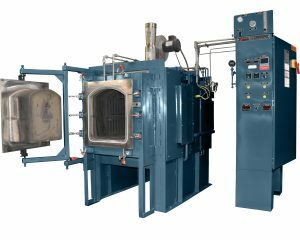 After de-bindering, the parts are then heated in a vacuum furnace to temperatures in excess of 2,300°F. The result is a super-strong component that is more resilient and lighter than titanium. All L&L furnaces can be configured with various options and be specifically tailored to meet your thermal needs. We also offer furnaces equipped with pyrometry packages to meet ASM2750E and soon-to-be-certified MedAccred guidelines. If precise temperature control and uniformity is a key to your process, then L&L’s XLC series is a great choice. Please be sure to visit our new website at www.llfurnace.com.